If you are moving from “beginner” to “intermediate” drone pilot status, the Bebop 2 series is in the right parameter range for you. 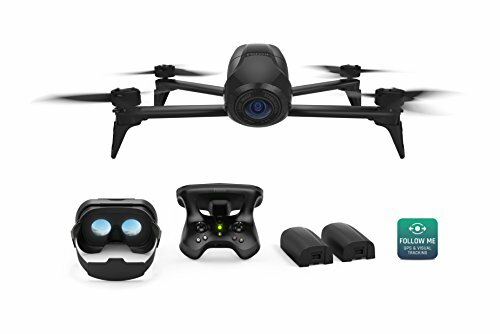 No longer using a cheap toy drone, you are now ready for a real high performance longer distance drone, immersive flight experience with FPV goggles, high speed (up to 65 mph) and programmable flight path. Parrot Bebop 2: Parrot Bebop 2 is the FIRST camera drone in the 500g category with 25 minutes of flight time. Use your mobile device to view and control the quadcopter. Parrot Bebop 2 FPV: Parrot Bebop 2 FPV includes Cockpitglasses (older model) that provide you with FPV and immersive flight experience, and an extended range ground controller (older model). 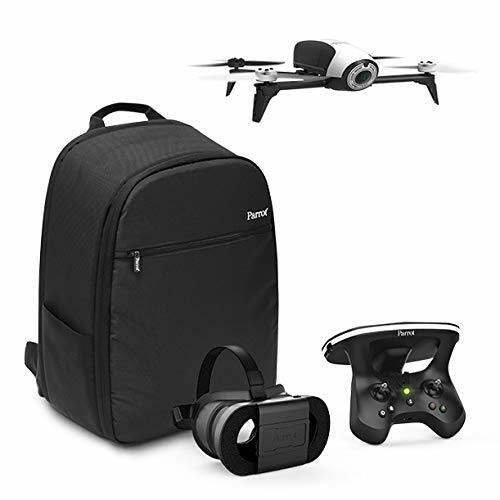 Parrot Bebop 2 Power FPV: Parrot Bebop 2 Power FPV includes the latest model of Parrot Cockpitglasses that give you FPV and more captivating immersive flight experience, and the latest technology Parrot Skycontroller 2 extended long-range ground controller, and free software app for fully automated flights. We are featuring the Parrot Bebop 2 Power FPV model in this review. The flight time of the Power edition is 25 to 30 minutes per battery. With two batteries you can be out flying your quad copter for about an hour. Included in Parrot Bebop 2 Power FPV are the Parrot Cockpitglasses that provide an immersive flight experience, and, Parrot Skycontroller 2 long-range compact controller with extended range of up to 1.4 miles (2km). It must have been challenging for the engineers who designed the Parrot Bebop 2 Power quadcopter to provide extended flight time in an affordable price range. In order to get a quadcopter suitable for an intermediate pilot that will fly for 25 to 30 minutes, the designer must produce a light weight low priced product. Designing a light weight quadcopter is not that hard, but keeping the price down at the same time makes for a very difficult engineering task. What we are looking for at this level is a quadcopter that has a range of over 20 minutes, FPV goggles and enough features that the kids can spend a few months learning and practicing piloting skills, but also can automate some activities (like taking selfies aka “dronie) so the kids don’t crash it while learning. Well, we found it! Compact and lightweight quadcopter drone. The digital gimbal helps to provide a lighter craft. Ultra-precise piloting and longer flight range. Immersive flight experience with FPV goggles. You can change your point of view by turning your head. Produce full HD 1080P videos and still photographs in RAW, JPEG and DNG format. High capacity battery with up to 25 min life. 3-axis digital stabilization system for smooth and stable videos. Compatible Smartphone screen size for the Cockpitglasses: 4.7 – 5.2″ / 12 – 13 cm. Flights in “sport mode” can be as fast as 65 mph. The ground controller is the Skycontroller 2. This controller provides extended range and more responsive control of the older version of Bebop. It provides take off and land with one button control. You can also control flight modes. There is no carrying case for transport. Designed to allow amateur photographers take professional quality videos. Has Follow me, orbit, boomerang, Parabola and Tornado modes. Can be controlled with the Skycontroller or your mobile device. The “Free flight” flight planning tool allows you to fly a fully automated flight. Free with this package. It can fly in moderate winds (20 or 30 mph). This quad copter can automate so much of the flying that you may want to make a choice to manually fly it just to hone your skills. Overall Rating for Parrot Bebop 2 Power FPV quadcopter : 9.5/10 for a FPV quadcopter with 60 minute flight time in the $500 range. Great price point for this class of ultra-precise piloting and long flight range. Two high capacity batteries with up to 30 min life each. Fairly light weight. Crashes cause more damage than I like. Comparable Model: Parrot Bebop 2 FPV. If you are going for a smaller budget, consider the older version of Parrot Bebop 2 FPV. The Parrot Bebop 2 FPV (View on Amazon) is the FIRST camera drone in the 500g category with 25 minutes of flight time. Flight range of 400 feet to about 1 mile. You don’t get the new Sky Controller 2. But You still get immersive flight experience with the FPV gogglese. Camera: 1080p/14mpx. Parrot Bebop 2 FPV has 3-axis digital stabilization system for smooth and stable videos. Summary: Should you buy Parrot Bebop 2 power FPV pack? This Parrot Bebop 2 power FPV pack (View on Amazon) has it all: aerodynamics and propulsion system, power two battery life of 60 minutes (30 minutes each). The FPV goggles really make this quadcopter a lot more fun of captivating immersive flight experience. The new Skycontroller 2 gives better control and longer control range (2 km or 1.4 miles) than ever before. The FreeFlight Pro mobile app (designed to work with your Skycontroller and the Cockpit glasses) allows you create a fully autonomous flight plan. You get the Follow-Me in-app feature, orbit, boomerang, parabola and tornado modes; advanced visual recognition technology and GPS tracking. Software update required before flight? Yes.